Part 2 of our series on Cold War 2.0 focuses on Russia’s hybrid warfare. From Georgia to Ukraine and going through the meddling into election processes, Russia has implemented a wide array of tactics to undermine its Western adversaries. You missed Part 1? Find it here. After every Russian military intervention against a neighbor remains uncertainty, the lack of rule of law and economic development, and an abundance of soldiers. These so-called grey zones surround the borders of Russia: in Georgia, Moldova and Ukraine. De jure, they still belong to the countries they used to be part of but they are de facto controlled by Russia. The grey zones are the evidence of Russia’s expansionism and their unresolved status results in persisting conflicts between Russia and its neighbors. There are currently seven such grey zones in Eastern Europe: Transnistria in Moldova, Abkhazia and South Ossetia in Georgia, as well as Luhansk, Donetsk and Crimea in Ukraine. While it is not on the border with Russia, the region of Nagorno-Karabakh in Azerbaijan can also be included in the list. Russia does not maintain troops in the unrecognized republic of Nagorno-Karabakh but the standoff between Armenia (where it aims to belong) and Azerbaijan (where it broke away from in 1988) enables Moscow to project its power into the region. Instability and the tensions it creates are the key sources of Russian power in the grey zones. Almost ten years ago the conflict between Russia and Georgia over the regions of South Ossetia and Abkhazia was the first instance when Putin (president at the beginning and prime minister towards the end of the conflict) used the strategy of supporting separatist movements in a neighboring country. The two breakaway regions of Georgia have always been a source of domestic conflict for the Eastern European country, and by extension, an opportunity for Russian interference. The first time South Ossetia gained autonomy was in 1922, following the annexation of the independent Democratic Republic of Georgia by the Soviet Red Army. It is likely that the Soviets then granted autonomy to the Ossetians in exchange for their support against the Georgian government. Georgia became independent after the fall of the Soviet Union in 1991 which was followed by a military conflict between the new republic and its northern breakaway region, South Ossetia. The Ossetian separatists were once again aided by Russia, ending the conflict with a ceasefire and an agreement to keep Georgian, Ossetian and Russian peacekeepers in the region. The same process went down in Abkhazia, another breakaway region in the northwestern part of Georgia, topped with an ethnic cleansing of Georgians living in the territory, decreasing their population from 240,000 to 46,000. 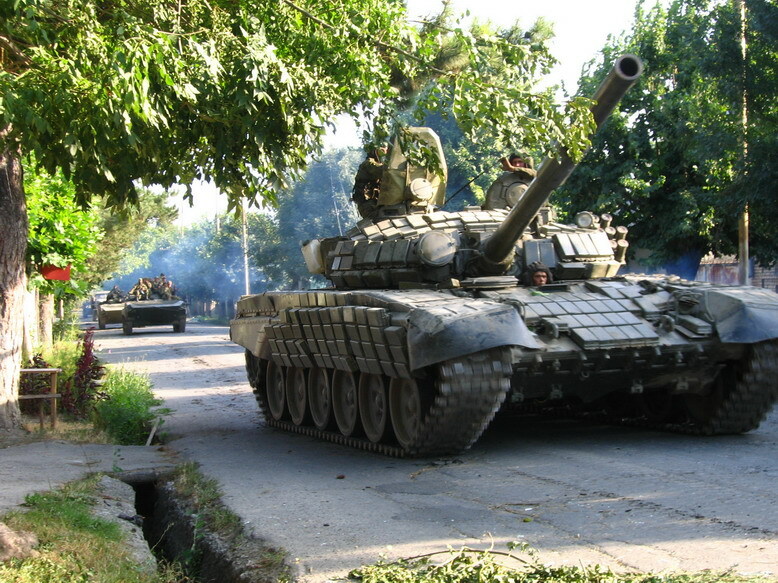 While tensions were constantly at a heightened level, there was no direct confrontation between the Georgian government, the Ossetian separatists and Russia until 2008. Simultaneously to Georgia stepping on the path to becoming a NATO member and signing an association agreement with the EU, South Ossetia and Abkhazia were seeking recognition for their independence. In March 2008, they submitted formal requests to the Russian parliament (Duma) for an official approval, citing the newly independent Kosovo as an example (recognized by most Western countries, but not by Russia). The Duma issued a resolution calling for then President Putin to consider the recognition. A month later Putin issued a decree establishing official ties between the Russian government and the separatists in South Ossetia and Abkhazia. However, this process was halted when a Russian jet shot down a Georgian reconnaissance drone flying over Abkhazia on 20 April, leading to a direct military confrontation between the two sides in South Ossetia, with Russian troops marching into Georgian territory, stopping only kilometres away from the capital, Tbilisi. The confrontation ended after five days with a peace agreement brokered by then French President Nicolas Sarkozy. Russia partially withdrew its troops from Georgia, as part of the ceasefire agreement, but continued to maintain soldiers at checkpoints near both territories. Soon after, Dmitry Medvedev (who took over the presidency from Putin in May) signed a decree acknowledging the independence of South Ossetia and Abkhazia, drawing condemnation from the international community. A decade later, both regions remain in a “frozen” state, broken away from Tbilisi but not formally independent. Though the first and fifth points of the doctrine emphasize Russia’s commitment to international law and peaceful relations with its neighbors respectively, the above passage clearly highlights the Kremlin’s justification for intervening (militarily or otherwise) in countries formerly part of the Soviet bloc, especially if they are home to Russian speaking minorities. 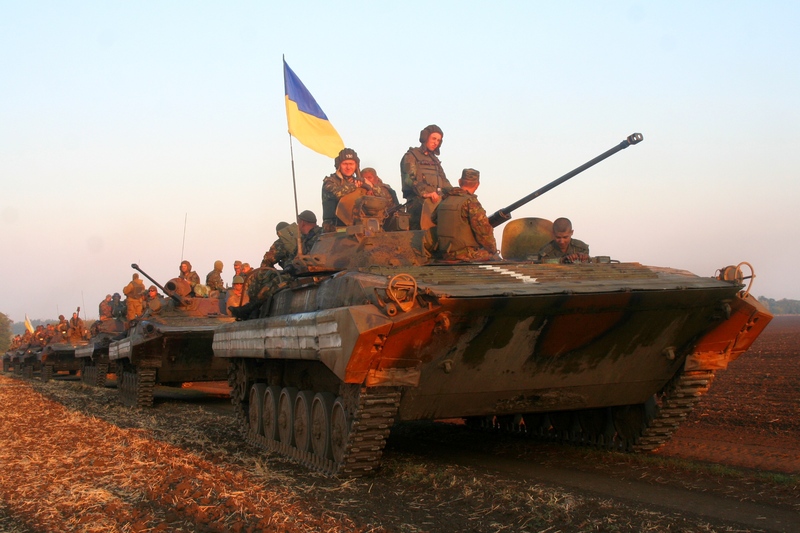 This doctrine will also pave the way for the Ukrainian conflict five years later. What first looked like a mass protest against the government soon turned into a full-scale military conflict that tore the Eastern European country apart. Protests first erupted in November 2013 in the Ukrainian capital of Kiev, when President Viktor Yanukovych suspended talks with the EU on signing a trade and political agreement that would have put the country on track for a future accession to the Union. Yanukovych, whose base was located in the Russian-speaking Eastern part of the country, was pressured by Russia to back out of the deal, which had long been wary of the country’s rapprochement with the West. The protests turned violent in February 2014 when government forces shot into the crowd of protesters killing dozens. A week later the government collapsed and Yanukovych fled the country. This pushed Russia to take advantage of the chaotic political situation and enter the Crimean Peninsula located in the south of the country (home to Russia’s Black Sea naval base). It took no more than two weeks for the Duma to approve sending the Russian military to the autonomous Russian-speaking Crimea, annex it and have this operation legitimized by holding a referendum, a move widely criticized by the international community. Infamous Russian-speaking soldiers wearing unmarked uniforms swamped Crimea and soon thereafter, appeared in the Eastern Ukrainian regions of Luhansk and Donetsk. The temporary Ukrainian government in Kiev sent troops to crack down on violence in Eastern Ukraine, but by April, separatists declared independence in both regions. Though by the spring of 2014 Ukraine elected a new president and the EU trade deal was eventually signed, the status of Crimea and Eastern Ukraine remain unclear. As of today, Ukraine is split into three parts: (Western) Ukraine, where life goes on as before, the grey zones of Eastern Ukraine, and the Crimean Peninsula, which, though not internationally recognized, is de facto controlled by Russia. 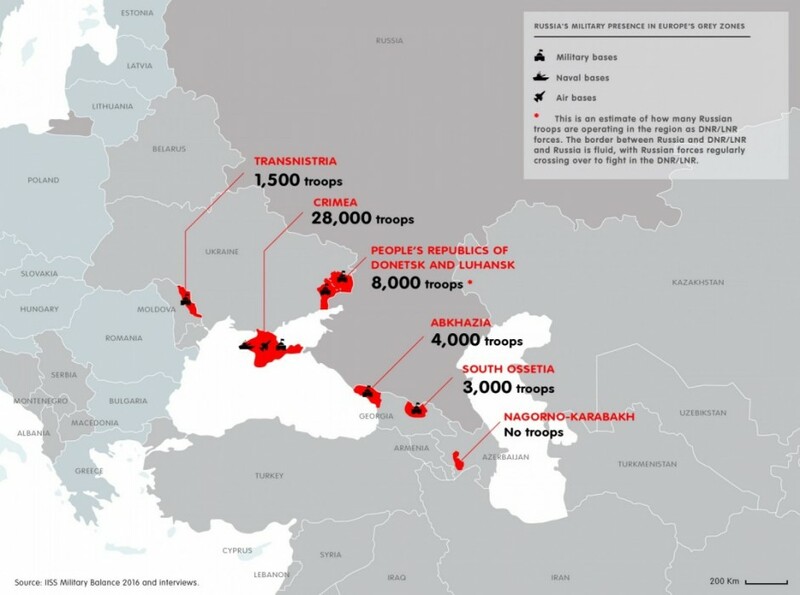 Russia’s strategy of keeping these areas in limbo (or “frozen”) seems to work. On the one hand, the fact that Georgia and Russia have unsettled territorial disputes prevents these countries from joining any other alliance, such as NATO or stepping on the road of becoming members of the European Union. On the other hand, they provide a way for Russia to increase pressure on domestic policies in Tbilisi or Kiev by threatening to heat up the conflicts with further military mobilization. This means that as long as the status of these grey zones remains unclear, Russia will have leverage over its neighbors without having to directly occupy any territories. Apart from creating grey zones, and thus insecurity along its borders, Russia introduced another new element to spread its power: the use of hybrid warfare. In fact, it not only introduced it, but mastered the rules of the game. Hybrid warfare incorporates a blend of conventional/unconventional, regular/irregular, as well as information and cyber warfare. By deploying soldiers in unmarked uniforms (the so-called “little green men” who create upheaval and divisions within the population) in Ukraine or using its cyber capabilities to interfere in the domestic affairs of Western adversaries, Russia aims to create instability. It does so not only on its borders by stalling its neighbors’ integration to the West, but on the international scene too, where it sows distrust between allies and hampers international cooperation. Manipulation, propaganda and subversion were the instruments of the Cold War. This does not mean countries do not use them anymore. On the contrary, these tools became part of cyber warfare strategies. Russia, is ahead of Western countries in waging hybrid warfare, part of which is launching cyber attacks and manipulating populations of adversaries via the Internet. The digital attack against Estonia in 2007 was one of the first instances when Russia resorted to information warfare against a European country. Within the course of three weeks, Russian hackers managed to force the Baltic country to severe its international electronic connections and largely disappear from the internet. The success of the attack against Estonia gave Russians enough confidence to use similar tactics, this time, combined with a military operation against Georgia in the South Ossetian conflict. The goal of the synchronized cyber attacks was intelligence gathering for strategic, operational and tactical level military operations. Their purpose was to aid the military invasion by disrupting communications, gathering military and political intelligence and spreading Russian propaganda. The invasion of South Ossetia and Abkhazia was a success. However, the extent to which the supplementary cyber actions played a role in this success is unclear. Russia started to use this tactic against other countries too, moving away from its sphere of influence, towards the West. The strategy that was initially aimed at neighboring countries such as Estonia, Ukraine and Georgia is now being used against Russia’s biggest rivals: European countries and the United States. According to research from German think tanks, including the Global Public Policy Institute and the German Council on Foreign Relations, Russia turned its attention towards Western Europe roughly around the same time it annexed Crimea, drawing a parallel between its territorial and cyber expansions. The opportunity presented itself in the form of a number of elections of major offices: the presidential elections in the US in November 2016 and in France in the spring of 2017, followed by the parliamentary election in Germany later that year. The fact that Russia has been preparing for these major cyber campaigns since the Ukrainian crisis of 2014 is demonstrated by its extensive network of media outlets that entered foreign markets in the past few years. The network’s goal is to spread Russian propaganda around the world, and attesting to this is the fact that all of these outlets are controlled by the Kremlin. The most influential players of the network are the television broadcaster RT (formerly known as Russia Today), the radio station Voice of Russia and the media platform Sputnik. The use of these channels together with the exploitation of loose social media regulations on privacy protection enabled Russia to intervene in the election of the highest office of the United States in an unprecedented manner. Following a nearly year-long investigation into the allegations over Russian meddling, the United States’ Department of Justice indicted 13 Russian nationals and three entities on charges of conspiring to defraud the US, conspiring to commit wire fraud and bank fraud and aggravated identity theft. Although the extent to which Russia’s interference affected the outcome of the US presidential elections cannot be determined, it succeeded in stirring up the political debate and discrediting runner-up candidate, Hillary Clinton. It also made Europeans worry. French presidential candidate Emmanuel Macron, a critical voice of Russia’s actions in Ukraine, was prepared for a cyber invasion. Indeed, his campaign suffered a major cyber attack just 48 hours before the elections when tens of thousands of internal emails and documents were released by a Russian group linked to the Kremlin. Apart from this incident, both France and Germany prevented a large scale cyber-attack similar to that of the US by introducing a wide-array of countermeasures ahead of their elections. Anticipating a possible Russian interference thus nipped the bud of Russia’s cyber ambitions. It is important to note, that despite the fact that cyber meddling looks like an attack against the West, Russia’s real target is not abroad, but at home. According to experts, Russia is not trying to convince other countries of its ideological superiority, it is merely addressing another audience: its own population. By targeting the US and European countries, Russia seeks to undermine the legitimacy of the Western alliance to show that it is no alternative to Putin’s rule. The main message is that Russia is not perfect, but it is stable. At least more stable than the West. Part 3 focuses on Russia’s involvement in the Syrian conflict and the implications of the recent poisoning of a former Russian spy.